In the wake of a destructive tornado, one girl develops feelings for another in this stunning, tender novel about emerging identity, perfect for fans of The Thing About Jellyfish . When a tornado rips through town, twelve-year-old Ivy Aberdeen's house is destroyed and her family of five is displaced. Ivy feels invisible and ignored in the aftermath of the storm--and what's worse, her notebook filled with secret drawings of girls holding hands has gone missing. Mysteriously, Ivy's drawings begin to reappear in her locker with notes from someone telling her to open up about her identity. Ivy thinks--and hopes--that this someone might be her classmate, another girl for whom Ivy has begun to develop a crush. Will Ivy find the strength and courage to follow her true feelings? 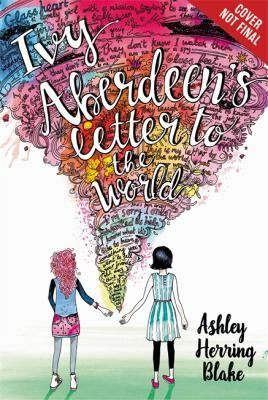 Ivy Aberdeen's Letter to the World exquisitely enriches the rare category of female middle-grade characters who like girls--and children's literature at large.